2 million images collected by NASA's orbiting Spitzer Space Telescope, which went into space in 2003, have been stitched together to create a 360 degree portrait of the Milky Way. We'd show it here, except you would actually need a billboard as big as the Rose Bowl Stadium to view it," said Robert Hurt, an imaging specialist at NASA's Spitzer Space Science Center in Pasadena. "Instead, we've created a digital viewer that anyone, even astronomers, can use." 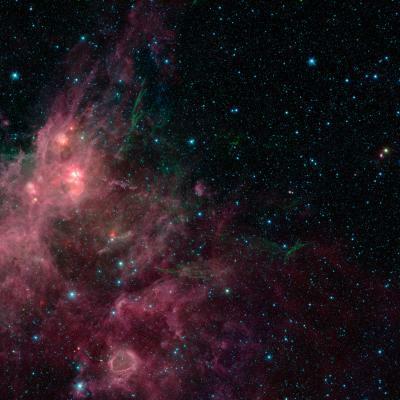 The new composite image uses infrared images gathered over the last decade and provides an unprecedented look at the plane of our galaxy, using the infrared imagers aboard Spitzer to cut through the interstellar dust that obscures the view in visible light. "For the first time, we can actually measure the large-scale structure of the galaxy using stars rather than gas," explains Edward Churchwell, a University of Wisconsin-Madison professor of astronomy whose group compiled the new picture, which looks at a thin slice of the galactic plane. "We've established beyond the shadow of a doubt that our galaxy has a large bar structure that extends halfway out to the sun's orbit. We know more about where the Milky Way's spiral arms are." The Spitzer Space Telescope has far exceeded its planned two-and-a-half-year lifespan. Although limited by the depletion of the liquid helium used to cool its cameras, the telescope remains in heliocentric orbit, gathering astrophysical data. In addition to providing new revelations about galactic structure, the telescope and the images processed by the Wisconsin team have made possible the addition of more than 200 million new objects to the catalog of the Milky Way. "This gives us some idea about the general distribution of stars in our galaxy, and stars, of course, make up a major component of the baryonic mass of the Milky Way," notes Churchwell, whose group has been collecting and analyzing Spitzer data for more than a decade in a project known as GLIMPSE (Galactic Legacy Infrared Midplane Survey Extraordinaire). "That's where the ballgame is." The survey conducted by the Wisconsin group has also helped astronomers understand the distribution of the Milky Way's stellar nurseries, regions where massive stars and proto-stars are churned out. "We can see every star-forming region in the plane of the galaxy," says Robert Benjamin, a professor of physics at the University of Wisconsin-Whitewater and a member of the GLIMPSE team. "This gives us some idea of the metabolic rate of our galaxy," explains Whitney. "It tells us how many stars are forming each year." "These are hydrocarbons — very complicated, very heavy molecules with fifty or more carbon atoms," Churchwell says. "They are brightest around regions of star formation but detectable throughout the disk of the Milky Way. They're floating out in the middle of interstellar space where they have no business being. It raises the question of how they were formed. It also tells us carbon may be more abundant than we thought." The data is also the basis for a "citizen science" project, known as the Milky Way Project, where anyone can help scour GLIMPSE images to help identify and map the objects that populate our galaxy. The data from the survey, Churchwell argues, will keep astronomers busy for many years: "It's still up there. It's still taking data. It's done what we wanted it to do, which is to provide a legacy of data for the astronomical community."